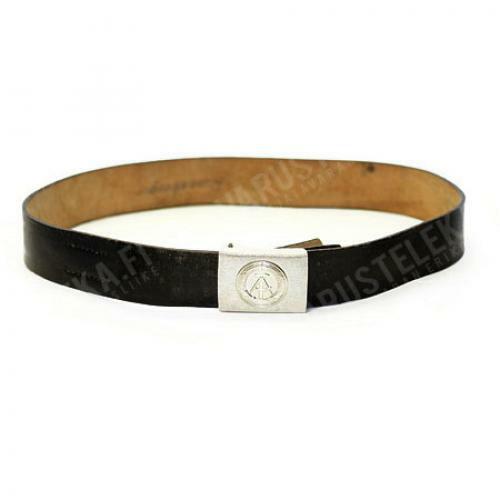 The East German leather belt is made with the same basic operating principle as the Wehrmacht model, but the clasp buckle attachment is the other way around. This means that these are not compatible with Wehrmacht buckles/belts. This is a very basic wide leather belt. The adjustment is carried out by moving the buckle along the tongue. These can be adjusted to be some 15 cm shorter than the given sizes. The width is a good, masculine 45 mm. The NVA leather belt is an excellent and stylish choice for a trouser belt, provided your pants have belt loops big enough. This belt doesn't overlap like regular prong buckle ones, so measure your waist, round up to the nearest size and pick that one. Alternatively you can measure your current belt from the hole you actually use to the prong, round up and go with that. Used, but in serviceable condition, might have some Mauer dust on them. Hit and miss! I've had 4 of these belts, 3 of which were unissued and really hard leather. The 4th was issues and in nicer shape. A couple of the crispy belts might be able to be worked in, but it would be a LOT of working indeed. And oil. Good belt. Can't go wrong for genuine east German leather at this price!